Hipacc allows to design image processing kernels and algorithms in a domain-specific language (DSL). From this high-level description, low-level target code for GPU accelerators is generated using source-to-source translation. As back ends, the framework supports C/C++, CUDA, OpenCL, and Renderscript. There is also a fork of Hipacc that targets FPGAs. 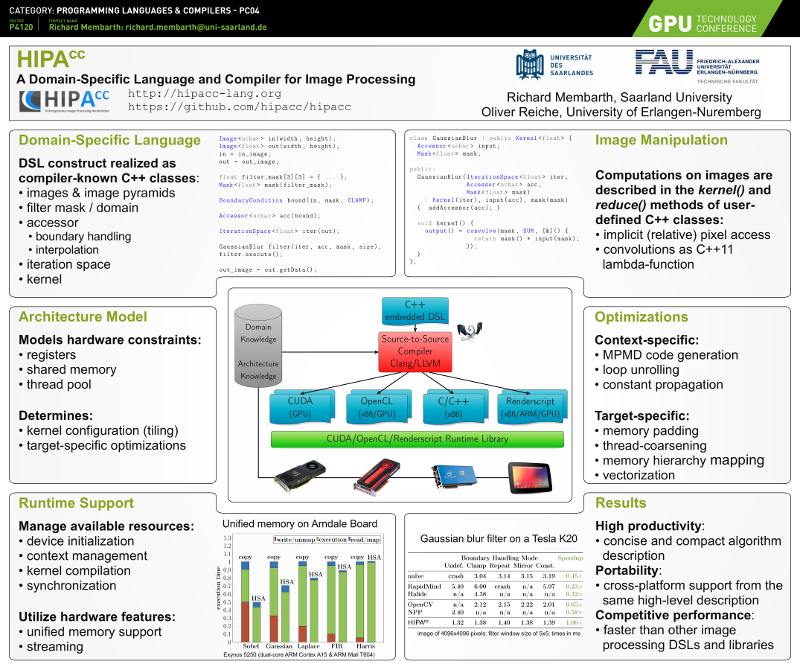 Hipacc allows programmers to develop imaging applications while providing high productivity, flexibility and portability as well as competitive performance: the same algorithm description serves as basis for targeting different GPU accelerators and low-level languages. The LinearFilter class shown below can be instantiated with a given filter mask. This will specialize the class for the filter mask such that optimized implementations emerge from the same high-level description. Examples for this filter class are the Gaussian blur filter, the Laplace operator, or the Sobel operator. The developers of Hipacc are Richard Membarth (@richardmembarth), Oliver Reiche (@oreiche), Mehmet Akif Özkan (@akifoezkan), and Bo Qiao (@qiao-bo). In Transactions on Parallel and Distributed Systems (TPDS), 27(1), pp. 210-224, 2016. In Proceedings of the International Conference on Computer Aided Design (ICCAD), pp. 1026-1033, Irvine, CA, USA, November 13–16, 2017. Invited Paper. In Proceedings of the 2019 IEEE/ACM International Symposium on Code Generation and Optimization (CGO), pp. 242-253, Washington, DC, USA, February 16-20, 2019. Dissertation, University of Erlangen-Nuremberg, pp. 1-215, ISBN 978-3-8439-3726-9, Verlag Dr. Hut, Munich, Germany, July 5, 2018. In Proceedings of the 18th International Conference on Languages, Compilers, Tools, and Theory for Embedded Systems (LCTES), pp. 21-30, Barcelona, Spain, June 21-22, 2017. In Proceedings of the 26th International Conference on Field-Programmable Logic and Applications (FPL), pp. 1-9, Lausanne, Switzerland, August 29-September 2, 2016. In Proceedings of the International Conference on Hardware/Software Codesign and System Synthesis (CODES+ISSS), pp. 17:1-17:10, New Delhi, India, October 12-17, 2014. In Proceedings of the Conference on Design, Automation and Test in Europe (DATE), pp. 86:1-86:6, Dresden, Germany, March 24-28, 2014. Dissertation, University of Erlangen-Nuremberg, pp. 1-215, ISBN 978-3-8439-1074-3, Verlag Dr. Hut, Munich, Germany, May 2, 2013. In Proceedings of the 26th IEEE International Parallel & Distributed Processing Symposium (IPDPS), pp. 569-581, Shanghai, China, May 21-25, 2012. Imprint © 2019. All rights reserved.